As one of the world’s most prominent individuals, the Pope is not without enemies. Despite these dangers, the Pope is well secured. In fact, he sits at the center of one of the world’s most sophisticated executive security systems. 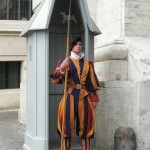 The Swiss Guard – Founded in the 1500s, the Swiss Guard is perhaps the most famous of the Pope’s executive security assets and is directly responsible for the Pope’s personal security. Although they are best known for their colorful uniforms, this elite unit is composed of Swiss military veterans trained to use both traditional and modern weapons. Shepherd One – When the Pope travels overseas he rides on the equivalent of Air Force One, dubbed Shepherd One. Unlike the US President; however, the Pope does not rely on a dedicated aircraft. Instead, measures for his executive travel security involve flying on a chartered plane operated by Alitalia, the Italian national airline. The Pope Mobile: Popes have long utilized personal vehicles. However, after the 1981 assassination attempt against Pope John Paul II, the Vatican started equipping its vehicles with transparent bulletproof glass, allowing the Pope to greet onlookers while providing him with protection. Host-Nation Security: During the Pope visit to US, the Vatican will also be able to count on the support of US law enforcement, and the two will undoubtedly coordinate closely throughout the trip. In fact, there have been reports that the US Secret Service has already disrupted a plot against the Pope’s safety. Truly, executive travel security for such important figures as the Pope is vital. The Pope is the spiritual leader of the world’s 1 billion Catholics and the head of Vatican City, a recognized and independent country. Pope John Paul II survived an assassination attempt in 1981, and Pope Francis is believed to be at risk from radical Islamic groups. The IMG Group is a leading executive travel security firm. Corporate or business organizations concerned about their need for security management expertise can reach out to the IMG Group for assistance. The company’s expert security consultants provide services such as employee travel security and corporate VIP security / executive travel security. IMG also offers assistance for businesses needing a corporate risk assessment or workplace violence consulting. In addition, the IMG Group can help you plan for a potential problem with crisis management consulting. Previous Post The Syrian Refugee Crisis: Impact on European Employee / Executive Travel Security?